A portfolio of TCC2019 race images are now online, they ‘web’ resolution only. High resolution images will be uploaded in due course when suitable wifi is available. Kharikola to Phakding is very much a transition stage. The first 3-days have been quiet with an occasional glimpse of life. From here on in, the experience changes, the trails become busier – mules and yaks are seen regularly and they must be respected… It can be a confusion for a runner, as they force a slower pace and one must wait for the correct time to pass. In addition, Porters are seen regularly, these people are the hub of this area of Nepal, without them, supplies would not reach the lodges and shops. The diversity is incredible. Children play, parents work and the runners navigate a way through this section to finish at what many consider to be the gateway to Everest, Phakding. At just under 30km’s, stage 4 of the ETR is arguably the most runnable. Leaving the monastery, a short twisting descent leads to the river and a long climb to aid station one at Kari La. It is here that the first real glimpse of the high peaks becomes real. They are no longer distant specs but now feel very real and surprisingly close. The descent to Surke (Cp2) is a 17km rollercoaster series of switchbacks of technical trail with occasional short climbs to sap the legs and lungs. From Surke, the trail now flattens a little, with a series of small climbs and descents that lead all the way to the finish at Phakding. Today was once again all about Jordi Gamito and Rai Purnimaya, the duo led from the front and were untouchable, they crossed the line in 3:34 and 4:25 respectively and now have strong leads for overall victory with two stages to go. Joan Soler and Sergio Arias once again were 2nd and 3rd, 3:52 and 3:58 for the men and Manuela Vilaseca was 2nd in 4:49 ahead of Becks Ferry in 5:31 who picked up and injury on stage 3. Tomorrow, stage-5 is a short day of just 20km’s and 2124m of vertical gain. It culminates at the monastery at Tyengboche with Everest, Lhotse and Ama Dablam providing arguably the most impressive finish line of any race! To be honest, it something that cannot be answered in just a few words. However, HERE is the article. I hope you find it of interest. I recently also wrote an article on shooting in Morocco, HERE. For those who may be looking to travel. I am speaking in October at TRF – Trail Running Festival HERE (in Poland) – Be great to have you come and say hello! I will also be signing copies of RUNNING BEYOND book. The 2018 Transgrancanaria HG started as planned at 2300 hours from a new start in Las Palmas. In the 24-hours before the race, it had been touch and go if the race would have a delayed start due to storms that were rolling in to the island. For example, the marathon was postponed from Friday to a Saturday start. In the hours before the start, rain storms moved through the island bringing with it strong winds and torrential rain. However, in Las Palmas it was all calm… was it the calm before another storm? Live music, thousands of people and on the stroke of 11pm, the runners departed along the beach for one of the toughest races in the world – 125km with over 7000m of vertical gain. As the name suggests, the route is ‘Transgrancanaria’ starting n the north-east and passing all the way down the spine of the island to conclude in the south at Maspalomas. Key moments come at Arucas, Teror, Fontanales, Presa de los Perez, Artenara, Tejeda, Garanon, Tunte, Ayagaures, Parque Sur and finally the finish line in Maspalomas. The ladies’ race was dominated by Polish runner Magda Laczak who pushed from the front right from the start. She opened a gap early on and pulled away as the miles past to finally finish 40-minutes ahead of the ever present and indestructible Andrea Huser, their times 15:18:37 and 15:58:11. Third placed lady was Ekaterina Mityaeva who is new to the UTWT ranks but over the past years has gained a strong reputation in the Skyrunner Works Series. Her form was good to close strongly and pass Fernanda Maciel for the final podium place. Fernanda had run a strong race early on but faded in the last quarter to finally finish 6th being passed by Beth Pascall from the UK and Eva Sperger. The ladies race had notable drop outs with some key favourites haveng a tough night, in particular Caroline Chaverot, Francesca Canepa and Emilie Lecomte. For the men, Pau Capell as defending champion was the man to beat and he looked relaxed with expectation on his shoulders. He ran smart, calm and cool as Frenchman Aurelien Collet dictated the pace from the front. At the iconic Roque Nublo the duo were less than a minute apart and Aurelien must have felt like a hunted animal. Pau eventually made his move and he opened a gap immediately which he extended to the line finishing in 12:42:08 ahead of Aurelien’s 12:56. A strong attack had been expected from the USA’s Tim Tollefson and certainly over the first third of the race his presence was felt, however, a recurring injury kicked in and he was forced to drop. Cristofer Clemente took over the reigns and running his longest ever race he surprised himself taking the final podium slot in 13:22. Daniel Jung placed 4th. As a year comes to a close, I always like to look back and consider the highlights of the year, not only personal highlights but global highlights of the running world. It is a daunting task at times. The running year is now so full that it can be difficult to remember what happened just weeks ago, never mind months ago. So, with this in mind, please consider that this article is my thoughts and not a definitive highlight of 2017. Having said that, I am going to make some huge mistakes and I am going to miss some key people, races and performances. I welcome you, the reader, reminding me of what they are – please, just be nice! So, let us look at 2017. I was considering going through chronologically and in all honesty, it may have been the better solution to the task at hand, however, I have just gone on impulse! Francois D’Haene is the best 100-mile mountain runner in the world – end of the story. The dude has been nailing it for years and when Rob Krar won 3 100’s in one year, so did Francois. The Frenchman has consistently dominated the distance and when the trail has vertical, he is almost unbeatable. In 2017, he elevated himself to a new level firstly beating the ‘unbeatable’ Kilian Jornet at UTMB and then setting (obliterating) the FKT for the John Muir Trail. He also ripped MIUT (Madeira Island Ultra Trail) apart, and the previous CR set by Zach Miller. Without doubt, Francois is the male ultra-runner of the year in my eyes. We just need to see him at Hardrock 100 now! Andrea Huser blows my mind constantly. She is the most impressive and consistent runner in the ultra-world and I often ask the question, if she raced less, would she win more? She has a string of top results but often has missed the big win. But when you race as much as she does, you can’t help but just nod in respect. Caroline Chaverot was unbeatable in 2016 and 2017 started with some issues, issues that she has battled with throughout 2017. Despite this, she won Hardrock 100. It was a great victory and not one without controversy… she left her bleeding pacer on the trail for others to help. Just recently she rounded out her year with a win at Saint E Lyon in France – the classic November night race. Ida Nilsson and Tim Freriks kicked off their seasons with victory at Transvulcania. Ida’s win was to be expected, but Tim’s win was a revelation. The ‘cowboy’ then went on to set a FKT in the Grand Canyon. Ida continued her great running throughout 2017 and then the duo turned up at San Francisco 50 and both won again – they topped and tailed the year and we can expect big things in 2018! Jim Walmsley and the PR machine in many ways signified a new era in the sport of ultra-running and not all for the better in my opinion. The hype around the 2017 Western States before the race pretty much had Jim with his buckle, the Cougar and a new CR. The reality was very different. Jim then went to UTMB and showed signs of learning the craft. He watched Francois and Kilian and paced his day. It eventually went wrong but he rallied and closed out strong. A definitive moment for Jim and I was well aware that this would be a turning point for his 100-mile future. He then confirmed he would run on Reunion Island at Raid de la Reunion! While I can admire the decision, for me, it was always going to be a questionable decision in regard to his ‘professional’ development. But I am being judgmental and I hope not in a negative way. I ‘get’ that Jim wanted to run on the island but the step-up from UTMB was huge and despite leading the race, he eventually dropped around the 100km mark. It has been a huge learning year for the fast man and I still hold true that up to 100km, the guy is pretty much un-matched. I am looking forward to seeing him nail 100-miles in 2018 (maybe 2019) and when he does, watch out, it will almost certainly be super-fast and mind blowing. Kilian Jornet pretty much was missing from the mountain, ultra and trail calendar for the past 18-months and rightly so. He had set targets on the final summit of his Summits of my Life – Everest. A failed attempt in previous year and then Nepal earthquakes had put things on hold. No bad thing. Kilian learned, progressed and then finally summited Everest twice in one week which blew the minds of the whole world. Of course, anything so amazing has questions raised over it and rightly so. Just recently an article appeared and Kilian responded. Read HERE. More will come to light in regard to Everest and ultimately one has to assume the Everest film will answer all questions. Post Everest, Kilian started running again and won a super-fast Sierre Zinal, he won Hardrock 100 with a dislocated shoulder, placed 2nd behind Francois at UTMB and won Glen Coe Skyline. In the winter, he has had operations on his shoulders and now is in recovery and waiting to get back into the SkiMo season. Kilian has nothing to prove in my eyes. What does 2018 hold? Who knows really, ultimately, Kilian is at the top of his game and he will go where his heart takes him… expect a Zegama appearance, a Hardrock appearance, maybe the Bob Graham will be on the cards and maybe he will be back in Scotland for Glen Coe. Who knows? Whatever the path, he will inspire. Camille Herron won Comrades, wow, it is the holy grail of road ultra-running. She then followed with a DNF at Western States and Leadville and I, and others, was left wondering what had happened. Oh, my word has she put the record straight. In recent weeks Camille has set a 100-mile world record 12:42:39, a 100km USA track record 7:36:39 at Desert Solstice and then went on to run for 12-hours and set a 12hr All-Surface World Record 92.708 miles. She is the new Ann Trason and arguably, she will be in for a shout as ultra-runner of the year. Courtney Dewaulter can push Camille close. This lady won Run Rabbit Run (again) this time losing her vision in the final 10km. She then went on to win Moab 200 (actually 238-miles) outright and then recently ran 250.079km / 155.391 miles in 24-hours setting an American record. Wow! Nuria Picas came out of the wilderness of 2016 and quite rightly, finally won UTMB. Nuria was unstoppable for many years but the big loop around Chamonix had eluded her, I firmly believe she can consider her career complete with this win! The UK’s Dan Lawson flew around the Gobi Desert to win with a new CR at the 400km Ultra Gobi. Dan is the UK’s hottest prospect at the long game, particularly when you consider past runs on the Grand Union Canal and 2nd at the iconic Spartathlon. Marco De Gasperi pioneered the way for Skyrunning on Monte Rosa in the early 90’s and has had incredible journey as one of the most respected mountain runners in the world. Finally, in 2017, Marco became the Skyrunner World Series (SWS) champion after an incredible season of consistent running and podium places – a true inspiration. Maite Maiora moved up several notches in 2017 and was a dominant force on the Skyrunning circuit with a string of victories and podium places. 2017 was her year in the sky! But let us not forget Ragna Debats, she had an amazing full season and triumphed over multiple distances in addition to a great run at the IAU World Trail Champs. Also, Sheila Aviles came of age… a name to watch in future years! For the guys, keep an eye on Jan Maragarit. UTMB had arguably the greatest male line-up of elite runners ever and it turned out to be great show down and we saw the confirmation that US runners are getting UTMB. Tim Tollefson was again flying the flag with a 3rd place. It is only a matter of time until we see an American win the big dance around France, Italy and Switzerland – will it be 2018? It could well be if Francois d’Haene and Kilian Jornet don’t run. Hillary Allen has represented the USA in Europe for a couple of years now and once again she was doing so in 2017. However, it all fell apart, before my eyes, at Tromso SkyRace in Norway. She fell many meters, bounced on the rocks below and came away with some serious injuries. Thankfully, the recovery process has gone well and I wish Hillary well for 2018. Ruth Croft has been in the mix for some time and I think it is fair to say that her victory at ‘Templiers’ in France recently has elevated to the New Zealander to a new level for the coming year… what does 2018 hold for this lady? 2017 most certainly has been a FKT year – Iker Karrera, Darcy Piceu, Francois d’Haene, Tim Freriks, Cat Bradley, Alicia Vargo, Rickey Gates and so many more have all taken the Fastest Known Time discipline to new heights but I wonder if ‘Stringbean’s’ FKT on the Appalachian Trail is the one that should have had more press and coverage? He soloed the AT quicker than Karl Meltzer and Scott Jurek and without help, but, relatively slipped under most radars. Read here. Jeff Browning crushed the 100-mile distance in 2016 and did so again in 2017, he is a great ambassador for the sport. Luis Alberto Hernando is for me, arguably one of the most talented runners in the world. But he is a quiet guy who in many ways, keeps himself to himself. He races hard and crushes the competition. In 2017, he once again became IAU World Trail Champion on a course that he, and many others said, didn’t suit him. The guy is pure class! The UK’s Damian Hall came to running late in life (not that he is old) but he has slowly and surely chipped his way through the ultra-ranks and this year just missed the top-10 at UTMB – an incredible result. Tom Evans broke on the scene by placing 3rd at MDS Morocco and in the process set a new benchmark for UK based runners to aim for. He followed this up with some other solid results in 2017 and I, like many others, wonder what 2018 holds in store. Rickey Gates ran across America. Nuff said! Read here. Ueli Steck, the Swiss Machine, died on the mountains and left the mountain world devastated by his passing. Here. Alex Honold free soloed El Cap in arguably one of the most awe-inspiring and risky climbs in the history of the sport. It is quite literally, off the scale and beyond comprehension. I know it’s not running but it is without doubt worth a mention! Here. The infamous Barkley once again served up another serving of spine tingling history with John Kelly finishing and Canada’s Gary Robbins left wiped out on the floor in tears. You can’t make stories like this up. Gary Cantrell (Lazarus Lake of Barkley fame) organised a race that went through his garden, The Big Backyard Ultra. Every 60-minutes, runners set off on a loop. During the night, the loop changed. The principal was simple, you keep going till one man or woman is left Standing. Well, Guiiiaume Calmettes was that man in 2017 running 245.835 pipping Harvey Lewis. Rachid Elmorabity once again won Marathon des Sables in Morocco proving that he is the greatest multi-day desert runner in the world at the moment. Elisabet Barnes, 2015 MDS champion once again returned to the sand pit after missing victory in 2016 and was unstoppable with a dominant and impressive force of sand running. MDS Peru followed on the 32-year traditions of its Moroccan big brother with the first edition in Peru’s Ica Desert. This was the first time any event was allowed permission to take place in this amazing National Park. It was great first event with Morocco’s Rachid Elmorabity and France’s Nathalie Mauclair taking the top honours. Michael Wardian did what he always does, run and run and run throughout 2017. But he kicked off the year with a world record running 7-marathons on 7-continents in 7-days. The guy just continues to impress. Best shoes of 2017? Well, this is well and truly a can of worms and I can only answer from a personal perspective. The Nike Air Zoom Wildhorse 4 here blew my socks off and is now my favourite day-to-day trail running shoe. For when it gets technical, gnarly, muddy and I need an aggressive shoe, the VJ Sport iRock2 here has set a new benchmark for me in regard to grip. Best clothing? inov-8 have continued to impress me with not only excellent run shoes but appeared to match. 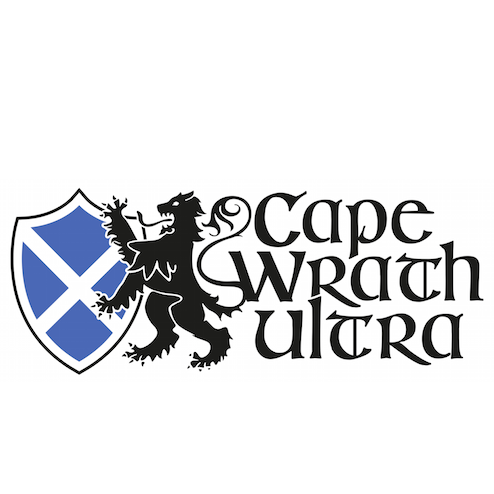 They now have a really specific line of products (including packs) that make them an excellent one-stop shop for anything that you would need for a messy and muddy 5km fell run to the tough and challenging 100+ mile UTMB. Best moment of 2017? That is a serious toughie but maybe Ryan Sandes finally taking that WSER top slot. I know how much he wanted it and he didn’t have an easy journey obtaining it. Huge respect! But hey, I have been inspired by so many in 2017. For me, I started travelling in January and I stopped in December. Yes, I have been on the road for 12-months and I consider myself to be truly blessed for the opportunities I have had to follow my dreams and make a living from it. I never take it for granted! While I could go into the details of each trip, I won’t. Every race is documented in words and images on this website and my social channels and you can find out about them should you so wish. BUT, and this is a huge BUT. My passion, and my work calendar comes at a price. I have a son, a family and an amazing partner, Niandi. They have all been neglected in 2017 with my travel and race coverage. It’s a dilemma and one that keeps me awake. I struggle for answers but I want to say THANK YOU for the support to all those people who mean the world to me, you know who you are. It’s about escape, my time in a place. Wandering and looking from within. The rich treasures a place holds. The people about daily life – I sneak in, capture a moment and take it away trapped for ever for others to see. The launch of RUNNING BEYOND book has required me to do several interviews recently and some of my words and images have appeared in print. 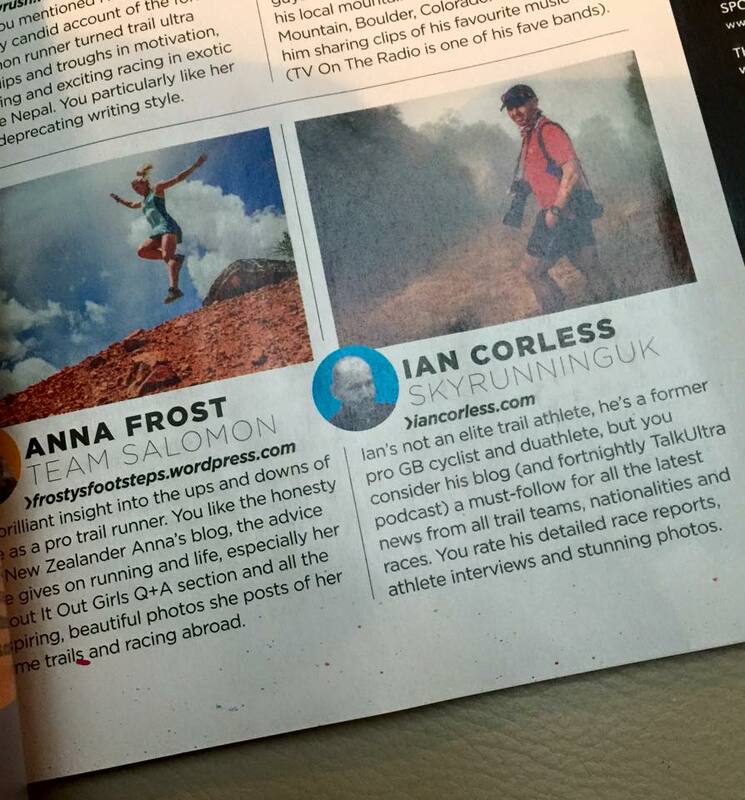 The most current edition of Outdoor Fitness has a large spread and RUNning Magazine in Portugal has a spread. In the coming week or so, the UK’s Like The Wind will also have a multi-page feature on RUNNING BEYOND book showing several images over 10-pages. Several week’s ago, my good friends at Marathon Talk Podcast, Tom Williams and Martin Yelling, did me the great honour of having me as a guest on their show. I have to say, these two guys are vey much the reason that Talk Ultra Podcast started and I am ever thankful to both of them and the support. Tom: This week’s guest has been a longtime friend of Martin and myself and a longtime friend of Marathon Talk – for six and a half years now so for probably something like four years, he’s edited the audio for Marathon Talk and probably saves mine or Martin’s blushes on more than one occasion, edited out the odd rude word perhaps in there and during that time he’s also built up the amazing Talk Ultra podcast which, has gone from strength to strength to strength and he is an absolute go to for ultra-running. He is as many would say, living the dream of making his passion his career and doing a really good job of it. He’s just bringing out a book, Running Beyond, which we’ll talk about in detail. Welcome Ian. Ian Corless: Hey Tom, thanks for having me! Feels a little weird being on this end of the microphone. 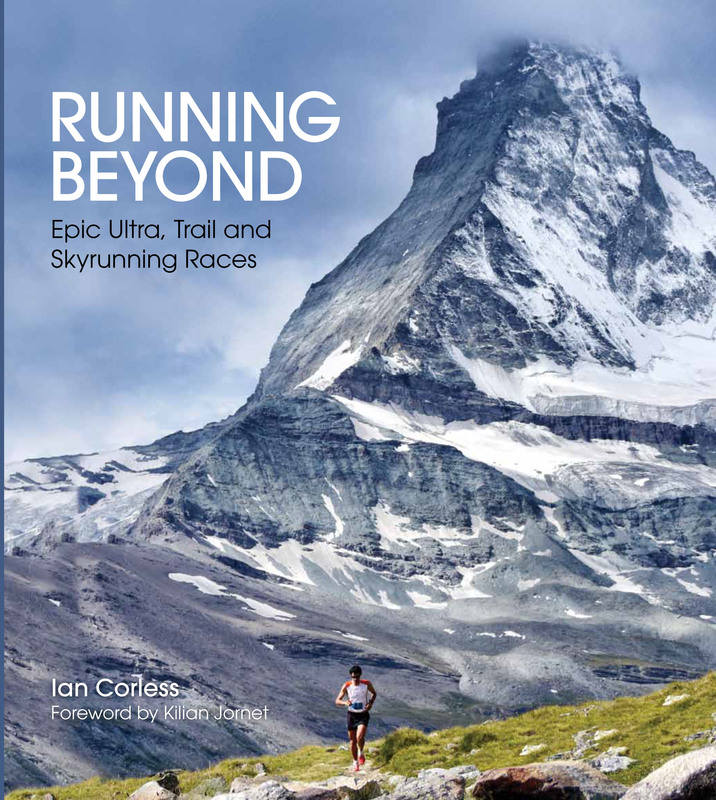 Tom: It’s been far too long getting you on the show and it’s nice to have the excuse of you having released your book Running Beyond – Epic Ultra Trail and Skyrunning Races. Foreword, nonetheless, by Kilian Jornet. Tom: Tell us about the book. Before we go back and talk about this whole crazy journey you’ve been on over the last four, five, six years, tell us about the book. Ian Corless: The book came about I suppose in a way by accident. It’s quite funny because Martin (co-host of Marathon Talk) said to me years ago, “Mate, you should do a book, you should do a book, you’ve got all these photographs you should do a book” and I did do a self-published book. But the problem with a self-published book is that you just can’t get the price of the book competitive. It just becomes ridiculous once you go to a hardback and color etc. The cost is just prohibitive. So I did a very small print run which was really for me, friends, family and a few people bought it and I used it as a giveaway to clients or potential clients and from that perspective it was a great vehicle. But then about two and a half years ago, I got approached by a publisher and they said, “We love what you do, we follow your website, we follow your photography and we think the time is right for a book”. Of course, it was music to my ears because normally you have to go hunting for a publishing contract and there they were contacting me. That was an amazing foot into the door. The process then was deciding what that book should be and of course, because the publisher wanted to go in a certain direction, I had to adhere to some of the things that they wanted so it had to be commercially viable. They wanted it to be a coffee-table book, they wanted it to be big and utilize the photography that I had done but also it needed to incorporate my experiences going from race to race. Over the last five years six years, I’ve traveled extensively to races all over the world and basically the book is about that but it’s not an A to Z of races. It doesn’t start at A and it doesn’t finish at Z and it certainly is not a book about ‘the’ best races in the world – it’s the races that I’ve been to and experienced and, in my opinion, of what has grown my photography and my writing within the ultra-running trail and mountain world. Tom: That’s quite an exciting thing, isn’t it? I listen to that and I think, “That’s really exciting I can’t wait to see it.” I went through a kind of process like that with a coffee table book a couple of years ago for park run, although I had no content in there of my own. I was just helping the guys do stuff but I think the guys did it really well. But for that to be your own book and your own content you must be really excited. Ian Corless: Yes, I’ve got copies at home and it’s quite funny because the first hardback copy arrived about two months ago and you know what? I’ve not looked at it. Tom: [laughs] You do know they spelled your name wrong on the cover, don’t you? Ian: [laughs] I’ll be having a word with the publisher if that’s the case! I say I’ve not looked through it, I have. I’ve flipped through it. But it’s a massive chunk of my life and to actually sit down and flick through it page-by-page almost intimidates me because I won’t look at the positives, I’ll look at the negatives [laughs], and I’ll think, “Maybe I should have put that photo in” or, “Why didn’t I do this?” or, “Why didn’t I do that?” And so in a way it’s frightened me to actually sit down and look at the book now that it’s done. Because there’s nothing that I can do about it, I have to assume that myself and the publisher did a good job and now it’s left to people, yourself and the audience who are going to get it and let them decide whether we did a good job. Tom: You have got some rave reviews. We’ll talk about your journey in a second. We talked before we started recording about you having a huge level of respect in the ultra-running community now as a really great journalist. 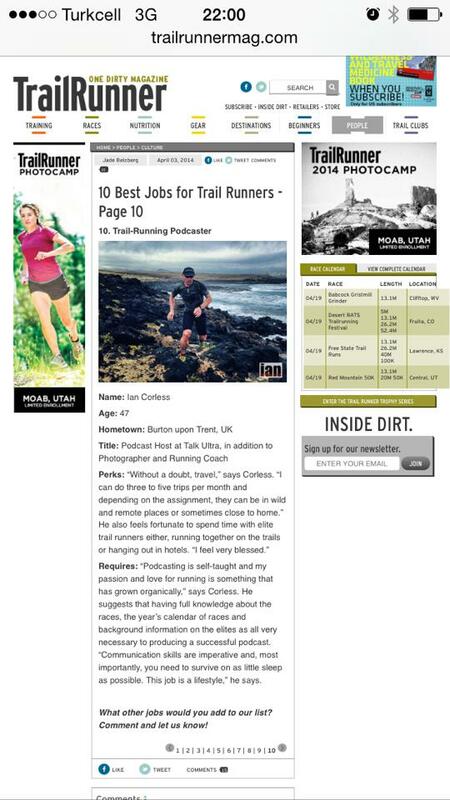 On your website and the promotion for this book, you’ve got Nikki Kimball, US ultra-runner saying, “Ian Corless continues to be one of the planet’s foremost journalist in the sport of ultra-marathon”. Check that out. Ian: It’s awesome to hear that type of thing. It’s flattering and we’re talking now five six years down the line and I know one of the questions you’re going to ask me is probably how did it happen and in a way I don’t know [laughs]. Tom: Mike Wolf, “If you know Ian, it comes as no surprise… he is the most motivated, talented and insightful photographer, journalists out there.” This is amazing stuff, how did you get… so we tried to get Kilian Jornet on the show a couple of times, we’ve never managed it. He is one of those few athletes that has truly transcended their sport and in a good way just does whatever he wants. I’ve got Summits of My Life t-shirts and I’m a fan of Kilian Jornet. He has moved up to that level of being just himself. But here you are with him writing the foreword for the book? Tom: He’s written some really kind words, “Ian’s photographs can tell you the passion of the sport, and the beauty of his images immerses you in the aura of each race.” Tell us a little bit about Kilian, how you managed to get that for a start but also what your experiences are with him as a person and what’s he like? Ian: I first met Kilian in 2012 at Transvulcania. That was probably the key phase of how everything started for me, when things really started to take off and I began to realize that there was an opportunity for me to convert what I was doing into a business. Prior to that, I was a photographer and always have been a photographer but I was a commercial photographer shooting advertising, food, room sets, people, all those types of things. Talk Ultra, a little bit like yourselves with Marathon Talk, came out of passion and an interest in the sport. I was competing in sports as you guys did cycling, ironman, and running. I was doing this thing that was an enhancement of my life and something that took up a massive chunk of my life but when you’re doing something you love it’s never quite work, it’s never quite hard. You always bounce it off with the fun and the bonuses. So 2012 I was invited to Transvulcania and it was a skyrunning race and Skyrunning held its conference and it was about how the sport was going to change. They invited the world’s best runners to the race, of which Kilian was one of them and he went on to place second I believe in that race behind Dakota Jones. Of course I met him and that was the first time we chatted but it was very much like meeting somebody famous and they hold you at a distance because you’re a journalist and they’re a famous runner and that was the scenario. Tom: He is to ultra-running what Kelly Slater is to surfing or Michael Jordan is to basketball. He is the greatest of all time. I don’t think many people would disagree with that? Ian: No. He has elevated the sport to a completely different level. He is within the very minute world of ultra-running and trail running, he is global superstar and I’m not saying that everybody on the street would know him, but certainly people who are interested in sport will know of Kilian Jornet and in recent years because he’s extended what he’s done to more extreme adventures and recently he’s just come back from Everest. Ian: Ha! Exactly, ever since he got a restraining order but if I see him we talk, we chat, we sometimes have dinner, we’ve been out for a drink. If you’re going to write a book you might as well have the best runner in the world write the foreword. I sent him an email and I said, “Look, feel free to say no, because I appreciate you get asked a lot of times for this type of thing” but he replied back and said, “Absolutely, no problem. I’ll do it”. It’s fantastic to have Kilian’s name on the cover of the book. Tom: It’s a lovely photo that you’ve got, the black and white portrait of him looking down. It’s stunning. Let’s go back to the beginning. You knew Martin for a long time before you knew me. Tom: At first I was editing Marathon Talk around the stuff I did and then we joined forces with you to launch Talk Ultra. Then in time, you took over the editing of Marathon Talk and you still do that to this day… I do visualize you editing in something like rusty twin prop plane over some snowy peaks. You haven’t done this your whole life though? Tom: …it was a kind of a career transition. You’ve already mentioned still life photography, photographing whatever it is – a bunch of grapes in a bowl? You’ve made that transition, amazing transition. What was the inspiration or motivation for that? When, why did that happen? Ian: It’s quite simple actually. It’s 2008. This is a difficult thing to talk about because it’s about one of those moments in my life where everything changed. Everything. In summary, without going into too much detail but I’m more than happy to go into detail if you want to, I lost my job, I got divorced, my dad died of cancer and I said, “That’s it. I’m never doing anything again that I don’t want to do”. Tom: How old were you then in 2008? Ian: I’m 50 this year [laughs]. Tom: Okay. What’s that, eight years ago. So you were roughly 42? Ian: Yes. So I made this decision. That’s it, I’m never going to do anything that I don’t want to do again. Tom: What were those things? What were you doing that you didn’t want to do? Ian: I think it wasn’t so much things that I didn’t want to do. It was I appreciated life and I’d appreciated that I had made some real gaffs in my life. I’d made financial mistakes; I’d got obsessed in sport – I am very OCD. When I’m doing something, I’m doing it. I guess that’s why I’ve made what I’m doing now successful because I can put blinkers on and I can work 20 hours a day. That is actually what’s needed to be done in the job that I’m doing at the moment. Sleep can be a luxury. But my obsessive-compulsiveness to sport, and that was participating, I’d really ruined my marriage. I had the foresight to be able to look back and think, “You’re bit of an idiot because you were never making a living from sport. You enjoyed it, you loved it and you’ve ruined a marriage because of it!” At the time my son was 12, he was old enough to understand what was going on and old enough to have some independence. But the impact on him and the impact on me was pretty bad. I missed home terribly… Plus, in 2008 also, I decided to run eight marathons in eight days, I don’t know if you remember? Tom: When you’re under masses of pressure and stress, that sounds like a really good thing to do; not! Ian: No. The thing was that the eight marathons in eight days was planned the year before and it was to coincide with me doing my last ironman, which I did in Klagenfurt and I think Martin was there for that. I think Martin raced Klagenfurt 2008? I did my last Ironman then I was going to run eight marathons in eight days and the plan was to run the Cotswold path all the way from the Gloucestershire to the Thames barrier. Then on the eighth day I ran on the marathon. A little bit like Martin’s South West Coast path jaunt, my dad was going to support me and he was going to be in a mobile home. In the months, two to three months before this venture was going to start, my dad said, “I’ve got cancer”. I went through this whole process of “No, I’m going to cancel, I’m going to do this, I’m going to that” and he said, “No. You carry on. You do this for me”. I remember distinctly, it’s quite a nice story in a way, it was the third day of the 8-marathons and I was finishing in Henley-on-Thames. That night was the night that my dad was going to hospital in Liverpool to have this major cancer operation. I finished my marathon, I had a car waiting for me. I drove up to my dad’s. I took him to hospital, waited during the night while he had the cancer operation, found out that the operation had gone well. I got back in the car, drove to Henley and then ran the marathon the next day. I remember running that marathon and not remembering it. I was an emotional wreck to be honest. I had also a lot of things going through my mind about, “This is ridiculous. Your dad is potentially dying and you’re running in a marathon”. How could I justify that? So, there was all those things and to cut a long story short, you come out of the end of all this and you’re just not the same person. My marriage very quickly fell apart, my dad got a different form of cancer which eventually killed him about four or five months later, and I lost my job in October. I started 2009 basically with no home, no marriage, my dad had gone. I had a blank canvas and so I started with the priming coat and built what I am doing now from scratch. Tom: It’s amazing. Huge! Wow… from that point to this point, it’s hugely inspirational because you did start from scratch. Tom: Because there’ll be people listening to this thinking, “I want to make changes. I want to do things. How do you do it?” We all look at people, we can look at your website, iancorless.com and see loads of success and inspirational content, whatever it is, but actually those first few steps are the most important by a million miles and people never really shout about those, share those. People aren’t aware of them so no one really knows where to start. Where did you start? Take me back to beginning of 2009. Ian: For two years it was rubbish. Ian: It really was because I had no money. My mom had spent her whole life with my father and then suddenly she was alone and vulnerable. I spent four months living with my mom because she needed the support. Then there came a point where I thought I had to say, “You know what mom, I’ve got to move out because this is not helping you” and also it wasn’t helping me. For four months, five months I was in a bit of a no man’s land. I was trying to get work as a photographer. I had clients, previous clients and I was getting some work but it was peaks and troughs. Sometimes you were busy, sometimes you weren’t. At the same time, sport was an escape. Of course, I got talking with you guys, with Marathon Talk, and I was helping provide you with some interviews in those early stages. I remember setting up an interview with Scott Jurek and what have you. Tom: Yes, I remember this, I think it was Scott Jurek or it might have been Ryan Hall that you set up first. It was one of our early really good ones where you said to me, “Why don’t you interview such and such?” and I said, “Well we don’t know him?” and you said, “Have you asked?” and I went, “No. Of course not, I’ve not asked them, what a ridiculous suggestion”. I think you asked them and they said yes! Again, it wasn’t that you were some huge well-known star, which you are now. It was actually just you were brave and bold enough to just ask people. Which a lot of it I was too scared to do. They won’t even reply to my email I thought… You had that ability to just to make things happen? Ian: Yes, I guess so. I look back or I try and think back why did I think that would happen? I don’t know, maybe I understood the community. I don’t know? Tom: People put barriers up there don’t they? And you didn’t seem to see those barriers. Even me I consider myself as a relatively barrier-free kind of guy but I even found just asking them to be ridiculous. Ian: Yes. I asked them and they said yes and then eventually I said to you guys, “You know what? I think the time is now right for an ultra-running podcast, because there’s obviously demand for this!” Then I came up with this crazy concept of doing a show that’s ridiculously long and everybody told me it was a really bad idea, it would never work but actually it has been the ‘USP’ of the show. Thank God I didn’t try and do it every week, because otherwise I’d be at a mental home or an institution [laughs]. It’s bad enough trying to get a show out every two weeks because of the amount of content that I’m trying to put in it. Tom: I don’t know how you do that? Ian: My audience run long and so if they’ve got a show that’s three hours, four hours long they take it on their runs, and that was always my idea. I think, if I look back, that was definitely one of the really key things with the podcast, it was making it a long show because the other podcasts that existed were normally 45-minutes to an hour. You can listen to it those shows on the bus, listen to it on the train whereas I produce this show that was long, something to listen to while running long! I think that was one of the key factors of its success. The podcast was like Marathon Talk. It was something that I was doing outside of everything else and I was still trying to make a living. But once you start contacting these people and interviewing them, you start to realize there is another world out here. As I said, I went to Transvulcania in 2012 at the invite of Skyrunning and I realized then when I was there because of my background as a photographer, because of what I was doing with the podcast – nobody else was doing this. It was that real brainwave moment! If I write, I podcast and I photograph this world, I am completely unique. That was the moment that I then put everything together and went headfirst into creating what I’ve now created. It was hard and it was slow and it was steady. Once you’ve done one thing good then something else good then people start to ask more and invite more or request more. I’ve always been very respectful of the runners. It’s really easy to be a fan. A classic example is Kilian. When you see him it would be so easy to go and run over to him and say, “Hi Kilian, how are you?” because he’s Kilian. I don’t do that. If he walks into a room, I’ll wave and I’ll let him come to me. I think that’s the way that I’ve always treated the runners. I just try and treat them as ordinary people. I also have been very, very careful in what I write and what I say and how I interview them. You’ll know that you often hear things that are not repeatable because you’re having a private conversation. I’ve seen it happen where a private conversation has ended up in print or ended up in a blog or something. That is the moment that your career is over. Once you betray that trust that you’ve built up, then your career is over. So I’ve always respected that, I’ve always respected their private space and that in turn comes back a hundred fold. “Yes, okay.” That’s a really crazy thing to do because you only last about three minutes if you go for a run with Sage. But I think that’s the important thing, that although I’m a photographer and a journalist and I’m writing and communicating about the world that they are in, I’ve broken down a barrier in that yes I’m doing that but I’m also approachable, I’m friendly, and I’m somebody that they don’t mind having around, which isn’t always the case with journalists. Tom: In that time period, fast forward now to the end of 2016 and you’re making a successful career out of something you love. First of all, that’s not always a good thing. To make your passion your career isn’t always as rosy as it sounds and sometimes people end up… and clearly that’s not the case with you but sometimes people end up no longer liking something they loved because it’s become a job and not fun. I’m interested in your thoughts on that and I’m also interested in your thoughts, without going into too many details and confidential stuff whatever it is, interested in as a business, how that is made up? Because I know having done Marathon Talk for a long time, at best, it’s made a tiny, tiny amount of money at worst it’s cost us a load and most of the time it just about breaks even in terms of costs. It’s not some golden ticket to living in Beverly Hills. You have to do it for passion. What is the business component of your business? Ian: I learned very early on, once you’ve hit rock bottom you don’t go buy a car, you don’t go buy another house. You keep expenses at minimum and you have fingers in fires. Ian: Fires or pies, whichever way. Ian: Is it pies? Fingers in pies, okay? Ian: Either way, I’m sure the audience understand. So I’ve never relied on any one particular source of income. I’ve tried to make sure that I’m doing a couple of things to cover the bills if need be. I guess this is one of the reasons why I still edit Marathon Talk. Sometimes I think to myself, “I’ve got so much on and I’ve got to edit Marathon Talk” but then again I remember when I needed Marathon Talk and so I’m reluctant to give things up. Martin said to me recently, “Mate, you need to learn to say no” [laughs], but it’s very, very difficult to say no. Tom: Slightly rich coming from Yelling! Ian: Yes, exactly. But you’ll appreciate this and I think most people listening out there appreciate. If you go to the office at nine o’clock and leave at five o’clock and that’s your only obligation and you get your cheque at the end of the month that’s fine, but I don’t. I’m my own boss, bank holidays they don’t exist, weekends they don’t exist. It’s all time that you work and build and like you’ve said, that is one of the negatives. It’s very, very difficult for me to take time away, to take time off because I’m always thinking and when you have a website that is about the sport that happens and changes daily, it’s like having this animal that needs feeding and you have to feed it all the time. You can’t go missing for a week and not post or write something because news has happened. One the advantages of the world that we live in is thank goodness for the internet, Wi-Fi and mobile phones – you can actually be anywhere in the world and do the job that I do. I don’t know whether I’m answering your question in the correct way but it’s about commitment, it’s about controlling to a certain extent how you start a day and end a day. That start and that end has to be really flexible with no fixed start and no fixed end and you need to fill the time. Ian: Yes, you have to have many different things. 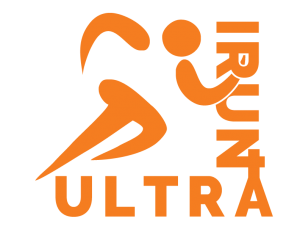 Talk Ultra is free for the audience just as Marathon Talk is. I don’t have any sponsors for Talk Ultra and I think it’s fair to say that directly from Talk Ultra, I don’t think I’ve earned anything. But Talk Ultra is a vehicle and we had this conversation years ago about the potential to make a living from a podcast, and I think it is possible but I’d have to devote myself 100% to the podcast and I’ve always had this philosophy with the podcast that I don’t want adverts and jingles. Because I think, from a listening point of view, what would I want to listen to? I wouldn’t want a jingle every 15 minutes, because it would be like turning the TV on and watching the film on ITV and then the commercials come on. I hate it. I don’t want that for the podcast, and although I’ve had conversations with sponsors in the past or potential sponsors, that would’ve been what would have had to have happen, so I didn’t do it. That maybe is a mistake, I don’t know but Talk Ultra has become a vehicle for what I do and it’s an outlet, and it keeps me in the environment that I need to be in not only with the runners, but with the community and the audience, and that’s invaluable. That connects me with everything else I do so when I go to a race, I can get content for the podcast at a race. I can provide a service to a race in the sense that I can give them exposure. That’s all into connecting with the business side of photography and writing. Tom: It’s amazing. We’ve had various partners on the show on Marathon Talk, and in various things I’ve done we’ve had various shows and sometimes you do think, “I’m not enjoying this component of what I do now because of x, y, or z”. Actually the more you can stay true to your principles the better… I would argue though that you will always struggle to commercialize a five-hour podcast. Tom: But commercializing isn’t your primary goal. Your primary goal is to do something you really love, you really enjoy, that people you respect really love and really enjoy what you do, and then turn that into a career as opposed to the former. I think about some of the things that I’ve got. 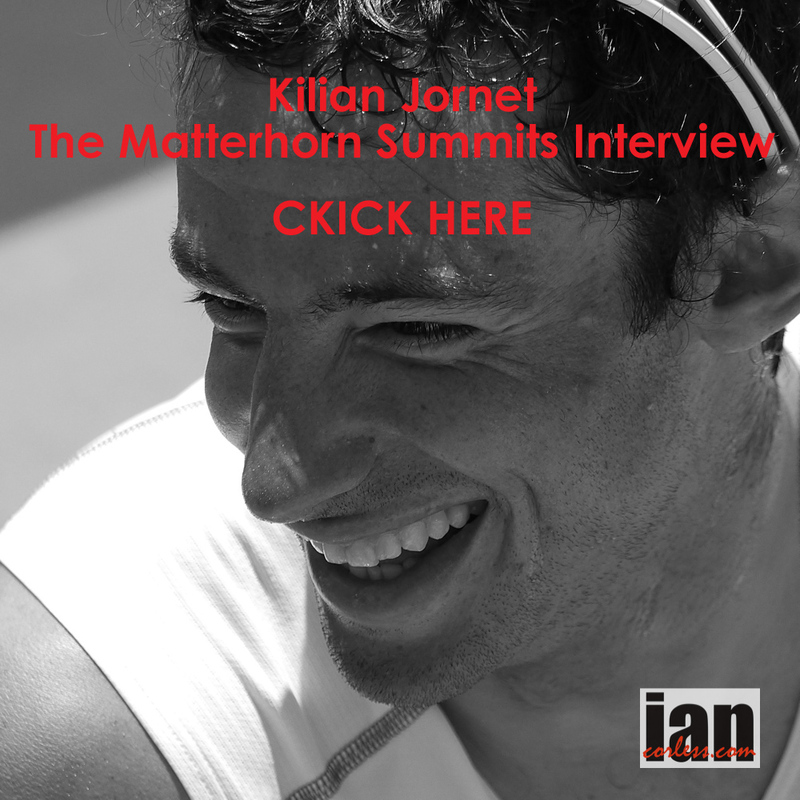 I interviewed Kilian when he set the fastest known time to the summit of the Matterhorn – I interviewed him the day after. I think about that interview and I think, “That is gold.” That is a pure piece of gold that can be listened to at any point. I interviewed Scott Jurek and his wife, Jenny for over an hour after they set the record on the Appalachian Trail last year. I think to myself, an hour of getting into the mind of Scott, you can’t put a price on that type of thing and I think that’s why the show works. If an interview takes 90 minutes, it takes 90 minutes. Of course, I might edit it down but the point is you can go so deep and get so much information in that time that you can’t get that anywhere, and I think that’s one of the advantages of Talk Ultra, and I think that’s why the audience like it. Ian: To be honest, and this is going to sound quite corny but it happens almost every month and sometimes it happens every week. I never take what I do for granted and I look at the amount of time that I’ve spent on the road in one year, and the places that I’ve been. This is going to sound like name-dropping and I guess it is name-dropping but this year alone, I’ll have been to Costa Rica rainforest, the Sahara, Nepal, to Everest, South Africa, Australia, and I just think… you said at the beginning of the show that you’re living the dream, and yes. I’m sorry, but I do actually think that sometimes I am living the dream. But it’s not easy and there’s a big price to pay for that. I’m in a relationship and that makes a relationship very, very hard when you spend so much time on the road. But key moments, I remember 2012, when all this started. There’s a mountain race in Italy called, Trofeo Kima, it’s one of the ultimate races. It takes place at high altitude, 3,000 meters, the course is ice, glaciers, rocks, via Ferrata. It’s just the most extreme race. I turned up at this race and I thought, “How on earth am I going to cover this race?” It’s 50 odd kilometers. Kilian can win the race in six and a half hours. How am I going to get around? They said, “Here’s a helicopter” and basically I just leapfrogged the course in a helicopter. The helicopter couldn’t land so we had to hover above the mountains and I had to climb out of this helicopter while it’s hovering, and then I’d have to run on the course, take photographs, run back, get on the helicopter, move to the next place. That was a real pinch moment. 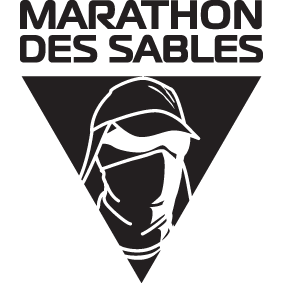 Marathon des Sables with Sir Ranulph Fiennes – daily going in to see him in the morning, seeing him at night, and chatting to the real James Bond. Ranulph Fiennes is the real James Bond. The guy is incredible. Here he is, one of the oldest competitors ever to complete Marathon des Sables, and of course Kilian. Kilian is an easy, a very, very easy name to drop but he is a legend. I’ve been at some of those key moments when he’s created a piece of history. He didn’t invite me to Everest though which was a bit disappointing. Tom: Rude, I’d call it. Ian: [laughs] I don’t think I would have lasted very long at six, 7,000 meters with Kilian. Tom: Yes, keep up with those cameras on your back. Ian: Yes. It’s very difficult to pick races and people. There’s a race in South Africa called, the Richtersveld Transfrontier Wildrun, and it takes place in one of these remote places on the Namibian border. 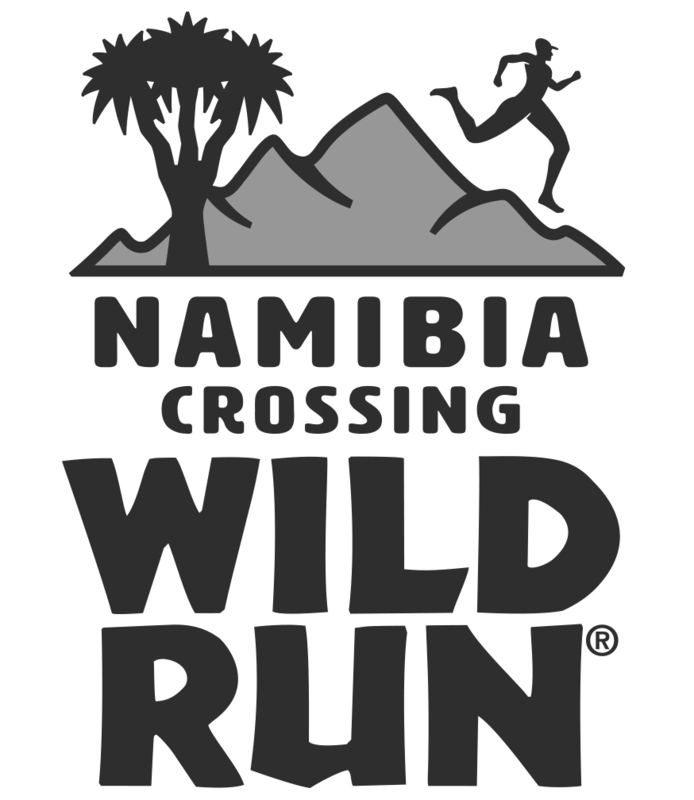 The race actually crosses the Orange river, goes into Namibia. It’s one of the oldest places on the planet, the landscape is amazing. You spend a night in the middle of nowhere in a tent, looking up at the amazing South African skies and you think, “Wow. I’m actually here working.” It’s just moments like that. Like I said, I never take anything for granted. Tomorrow, I go to Italy and I’ll be on Lake Garda, and I’ll be working in the mountains behind Lake Garda, and that almost becomes just an ordinary weekend. But I still get on the mountain, and I look down, and I look at the lake and I think, “Look at this, this is my office. This is today’s office. This is amazing”. Tom: A really interesting thought about hobbies. He says picking himself up… but an interesting observation of mine from running is that we separate the rest of running from ultra-running, the ultra-running seems to have done, in my opinion a really, really great job. A bit like cycling, of positioning itself as an aspiration or the aspiration is to see beautiful places, meet wonderful people, build friendships, be outside and it’s seen as enjoyable for its own sake, for the fact of doing it whereas the rest of running has got so fixated on times and have you done a marathon? And what’s your PB? It forgot, in my opinion, the rest of running forgot about the nicer things. Running is almost unique, I would say, in that you ask most runners if they enjoy running, most of them will say, “No” and they’ll come out with, “Well, I can eat cake at the weekend” or something, whatever it is. They don’t really enjoy it, whereas ultra-runners, it seems to me, have got it right and they are actually in the moment. For example, we’re talking about what are your best experiences are and they are amazing, bucket list experiences that actually anybody can do. Most of these races anybody can endure, anybody can take part and anybody can have the same experience. Ian: You are exactly right. 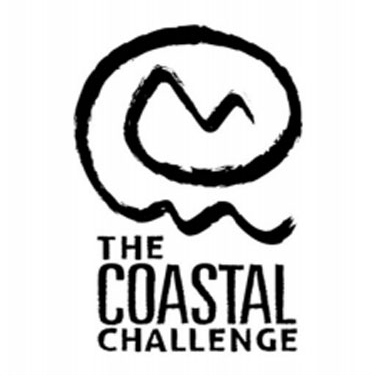 The sport is changing slightly, you know the FKT, fastest known time is becoming more and more popular, but it’s still taking place in the stunning location in an amazing environment. An FKT is about a runner setting something against a clock in a place and it’s the place that actually is really significant. Just this last weekend, a runner called Jim Walmsley set a new record in the Grand Canyon, running the rim-to -rim but also doing the rim-to-rim-to-rim, which is out and back. The Grand Canyon as a location is a stunning place and the speed that he ran is just absolutely phenomenal, but it was him in his environment testing himself and the point is that with an FKT, an FKT is personal. You can have your own FKT, your own fastest known time and that is great! As somebody who was competitive in terms of competitive with myself, not necessarily competitive within the sense of being elite but I always tried to do my best and a few years ago I started to get chronic knee problems and that has seriously impacted on what I can do. So FKT’s and personal journeys are great. I get asked all the time, “Ian, do you miss racing?” and I say, “No.” because I’m in the domain, I’m with the runners, I’m at races, and yes all right I’m not racing myself, but I’m still getting a fix. I can still be on the mountain, within the landscape – I just do things now at my pace, at my distance because the two are connected. If I get a day free before a race or a day free after the race I can go out on the race course and experience what the runners are going to experience in the race, but in my own time and then I can come back and talk to them and say, “I went up today and I did the vertical kilometer and came back down.” And they don’t ask, “Oh, what time did you do?”, they’ll just go, “Oh, cool, so you managed to find some time to get up there, yes the mountain’s stunning, isn’t it brilliant?” That’s the type of scenario that that we’re in. I think it started to get clouded a little bit with some prize money that’s coming in, and of course UTMB last year, we had the first EPO case which has raised alarm bells and then we’ve got the craziness of people like Rob Young. Underneath it all, Rob is a person and why did he think he was going to get away with it? You actually have to think, what was the reason he made that really bad decision? With the amount of scrutiny he was going to get… he wasn’t even a good liar. Why would you try and run a sub-three marathon when you’re running three thousand miles? Tom: Unfortunately, I think a lot of these things slide, they start out with the best intentions, they get carried away and then they just bend things a little bit because actually it’s a good outcome… Raising money for charity or whatever it is and actually the mind’s very clever in saying, “Well, that’s all right, you’re doing that for the right reasons” and then once you’re on that slope you just get tangled up and it runs away with you, doesn’t it? Ian: Lance, still to this day didn’t do anything wrong. That’s his viewpoint. He didn’t do anything wrong, because everybody else was doing it. And he still believes that. Tom: A bit of a cheesy question but I think a really interesting question. If you were, let’s take you back 30 years or 20 years and you’re 20 or 30 years old and you’re in the absolute shape of your life, fighting fit, but you know what you know now, so you know all the races you’ve been to, you’ve seen them firsthand, if you could be in the form of your life just once and go to one race and absolutely smash it to pieces, where would you go? Ian: That’s a really tough one. Can I give you two answers? Tom: You can give me two answers. Ian: Okay. From an ultra-running perspective there would be an obvious choice because you would go where you would have the biggest audience so that would be something like UTMB, because that’s the big showcase. If you won UTMB then you’d get all the plaudits and the slap on the back and equally something like Western States. It’s a much smaller race, but it’s completely respected in the community. Tom: Comrades if we’re going on the road? Ian: Comrades if you’re on the road equally. Mountain UTMB, trail Western States, road Comrades. If you could have your day and be up there and fighting with a chance for the podium one of those three races would be incredible. But if I could just go to a race and just have an absolutely fantastic time and feel brilliant, I’d probably choose a multi-stage race, like marathon Des Sables or Everest Trail Race because what I love about those races from a working point of view and from a running point of view is that they are journeys. I love to be in this place where they have a start point and a finish point and the way that you move through that landscape is by foot. Most of the time all the modern gizmos are gone because you’re self-sufficient, so your phone won’t work and it’s pointless carrying it, because it’s just weight, you’re eating around campfires, there’s no TV, there’s no music, there’s nothing and it’s primal. When I work on those races you come out of those races and you think, “That was just a transformative process”. I often interview runners who’ve gone through that for the first time and it’s changed their lives, they are not the same people who went in the race when they come out. They’re different, and it often changes what they do and for a lot of people it can be that point where it was for me in 2008, they come out of the desert or the mountains and they say, “You know what? I’m going to change my job and I’m going to find a way to give myself either more time or more money or whatever it is, but allow myself the freedom to do more of this, more adventures, more exploration”. Tom: You’re talking about life changing and so on, some of your guests have changed my life. You interviewed Barry Murray in a really fascinating interview and we ended up getting Barry on our show and then Barry ended up working with me for a year, helping me with my nutrition and lifestyle stuff. There’s actually, selfishly, there’s things that come out of the stuff we do that actually helps us. Have there been examples, cases with the people you’ve met and interviewed who they’ve really moved your life into another direction as well? Tom: 12th place or almost there I think. Just the long day in 36-hours and his finishing time was something like 60 hours, almost three times longer than Tobias! It’s that perspective that I see every single time I go to a race. The front people are the front people, they’re fast, they’re gifted, they’re talented, they’ll have the highs and the lows but it’s all the ones at the back who are putting one foot in front of the other. I think if you can take that motto into whatever you do daily… There’s always going to be somebody better than you but you have to keep going forward, you have to keep pushing, you have to keep putting the commitment in and if you don’t put the commitment in then it’s a DNF and you don’t finish. That’s the same whether it’s work, family, relationships, whatever. So I don’t think there’s any one significant person, although there are many interviews that have really changed me but I think as a global thing, it’s the experience of what people go through to achieve their own personal goals – I think that’s the most inspirational thing. Tom: Finally, of course, I can’t let you go without asking you a question. You’ve edited and listened to this show every week for the last four years or something like that, so you know it intimately. Let’s cut straight to the chase – six months, perfect training on the track, one mile… how fast? Ian: Can I have somebody else’s knees? Tom: Somebody else’s knees, yes. Ian: I knew this question was coming and I didn’t think about the answer. Tom: Have you done any timed run in the last year? Tom: No? Okay. Nothing to go off? Ian: My last marathon was Paris three years ago and I ran 2:53. So that’s what? Ian: Yes, it’s about that… I’d say I’d probably be lucky to get a 5:30! Tom: That would put you with Rich Castro, Frank Shorter, Kirk Parsley, Simon Weir etc. I think that sounds about right, you happy with that 5:30? Ian: Yes, I think so. It does hurt me a little bit because I know that you hit five minutes. I’m tempted to say 4:59 [laughs]. I think I’d be pushing the boat out for a 4:59. Tom: Well, I haven’t got your knees, my knees work. It’s the difference. Ian: I should try with Kilian’s knees shouldn’t I? Tom: Absolutely! Look, it’s been an absolute pleasure talking, thank you for sharing your amazing story or inspirational story. Apologies that it’s taken so long but it was worth the wait and I can’t wait to get my copy of the book, Running Beyond. As a final note, I need to give a huge thanks to my soul mate Niandi Carmont who has been a rock since 2009 and supported me on my journey in the world of trail, mountain and the ultra world – without her support and continued support this journey would not be possible. Thanks! Niandi running above the clouds in what feels like our second home, La Palma. The day has arrived, November 3rd 2016 and RUNNING BEYOND is available worldwide. It seems a lifetime since I started putting this book together and although the Italian, Spanish and German versions were released in October, it’s so satisfying to finally have the English version released today. The book will be available in store in all good book sellers and of course one of the easiest solutions for purchasing is via Amazon. Please note that RUNNING BEYOND has been given a different name in Italy, Germany and Spain. A Swedish version is also planned – more news on that to follow. The book has 240 pages of images and words that encapsulate some of the worlds most iconic ultra, trail and skyrunning races. The book is hard bound with a dust cover and is ideal for a coffee table, dimensions are 12 inches by 10 inches. To coincide with the launch of the book, a limited number of signed copies are available on a first come, first served basis. A book can be dedicated to you or another person if required. Postal address for the book. I have 10- copies that I can sign and personalise. Strictly, fist come, first served. What would you like Ian to write in the book? The 2017 iancorless.com calendar is now available to order. Canary Islands, USA, Spain, Andorra, Australia, UK, South Africa, Norway, Costa Rica and Morocco. Delivery of all calendars will take place in November with the last orders posted on or before November 29th. Delivery is guaranteed for Christmas and the print run is limited. There will be no re-print. To order a calendar please use the contact form below and choose your postage option. You will be invoiced via PayPal.